Any and all Fairbanks Band alumni are welcome to join us at the pep band game on Saturday, January 3. Rehearsal is at 6pm in the band room. You'll be admitted free to the game...just sign in on the sheet. 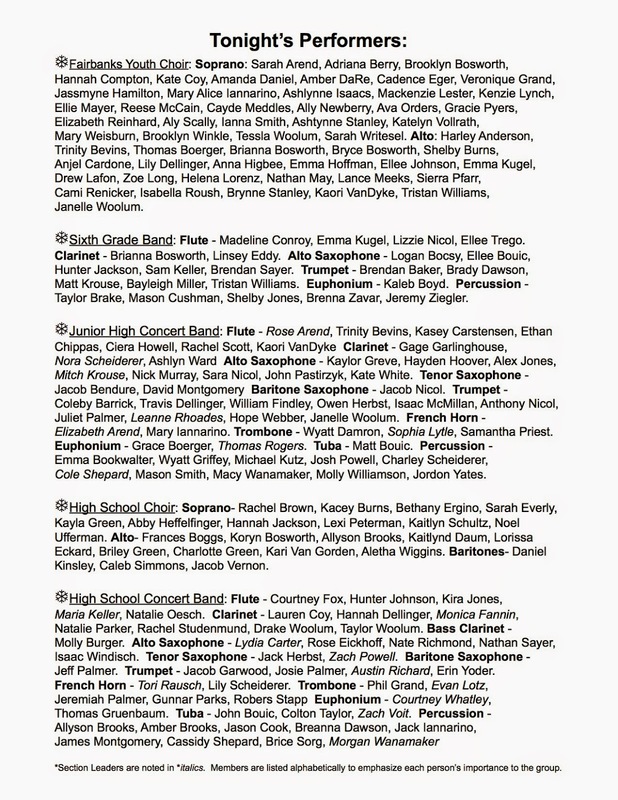 Many student band members will be there as well so don't worry if you're a little rusty. We've got you covered. Please message me and let me know if you need an instrument. Music will be available at the game. Spread the word to your band friends. I hope to see you all there! Holiday Concert 2014 - FHSCB from Fairbanks Band on Vimeo. Despite today's school cancellation due to fog, tonight's concert is still on! Youth choir will warm up before the concert in the band room. All the other performers are to be in the gym ready to watch the concert with their families at 7 PM. Help is still needed at 5:30 with the performer and audience set up. The more the merrier! As we get ready for the concert on Monday evening, I wanted to let everyone know that we will be selling Music Christmas ornaments. It is not a lot, but at least we can make a small profit that evening. I am also looking for comments and opinions on donations. I am coming to you to ask about the donations at the door, in the past, there have been mixed reactions about doing this. I know that the elementary students did this at the end of their concert, is it ok to have people at the doors? If so, some volunteers for the door would be great! Also, basketball season snuck upon me….. The Athletic boosters has agreed to allow us to run the 50/50 drawing at the games, we missed last Saturday night, I don't want to miss another game!! Can I get volunteers to run this for the boosters?? We will not meet this month, but will resume meetings in January. The meeting is currently scheduled for January 13, 2015 at 7pm in the band room. Fairbanks Music Department’s Annual Holiday Concert 2014 Monday, December 15, 2014, 7:00 P.M.
6th Grade Band You need to be seated with your family with your instruments and folder ready to watch the Youth Choir at 7PM. Immediately after the Middle School Choir’s program, go promptly to your performance seats on the gym floor. We will warm up on #85 in your book and then perform our program. After we are done, we’ll file out and then you will sit in with your family. Do NOT go back to the band room. After the HS concert band has concluded their program, you are free to go. Just a little reminder of all the upcoming pep band performance dates. Please do your best to be at every game, and let me know in advance if you cannot make a date. The Fairbanks Pep Band will perform at Nationwide Arena on Tuesday, February 24 before the Columbus Blue Jackets’ game versus the Buffalo Sabres. We will be performing between 6 and 6:30pm. After the performance, band members will get to enjoy the hockey game in its entirety and also receive a free Blue Jackets hat! Transportation will be provided for band members. *Students have been instructed to wear nice school clothes. Nothing fancy. Jeans and athletic shoes are fine so long as they look good. *Chaperones are to meet at the band room at 8am for instructions, coffee, and donuts. Chaperones are to ride the bus. *Students will be called from class at 8:15 to load the buses. Bus #1 is JHCB A-R. Bus #2 is JHCB S-Z and Sixth grade band. Students must ride their assigned bus to and from the event. *Don't forget to either bring money for fast food or to pack your lunch. *The bus will return by 1:45pm. We will be back for the end of 6th period and all of 7th period. *Students are reminded that they are responsible for any work missed due to this field trip. Please contact your teachers immediately if you have not already to arrange for make up work. I'm a music professor and Music Audition Coordinator at Wittenberg University in Springfield, Ohio. Each year, we award more than $350,000 in music scholarships. We award several dozen scholarships annually, for voice, band and orchestral instruments, piano, and guitar--and they are available to all students regardless of their major. I hope you have a very musical December! P.S. Wittenberg is a small college in central Ohio with a student/faculty ratio of 12:1 and more Ohio Professors of the Year than any other four-year college or university in the state. Our campus draws students from 40 states and 25 foreign countries. 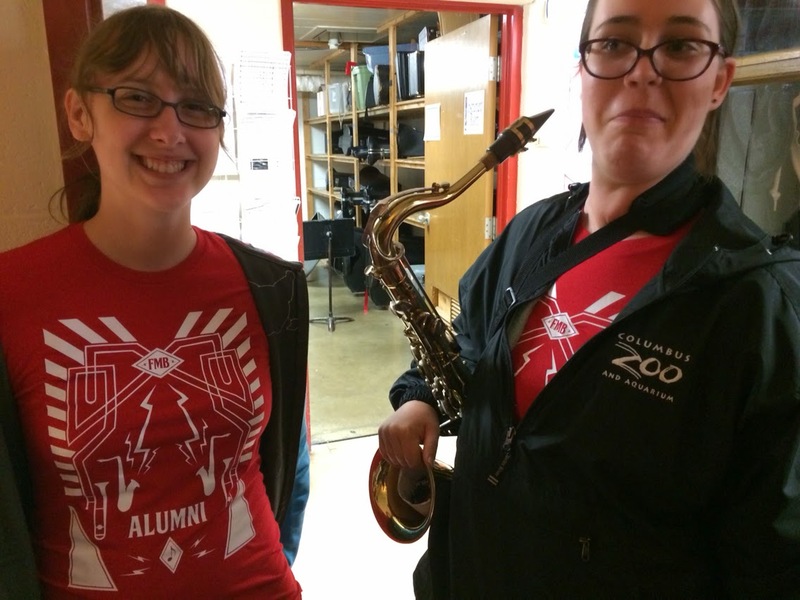 The Music Department is one of the most active departments at Wittenberg. Thanks to FHS alum Synthia Jester, we have a snazzy shirt design this year! 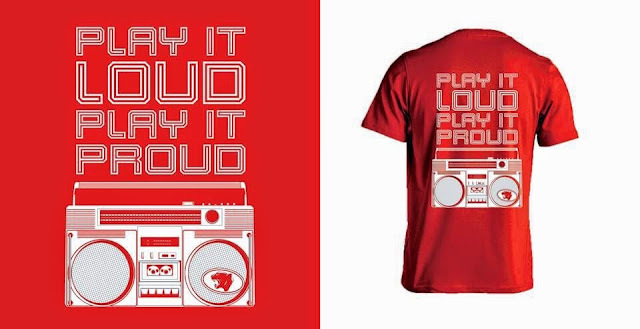 Shirts will be in by Friday for pep band members.